"Art - inspired by nature, born of the soul." I am a long time resident of Tsawwassen, originally from Vancouver, Canada. I am now enjoying the retired life following rewarding careers in both nursing and personal training. I enjoy time spent with nature, both in my garden at home and at the family lakefront cabin in the summer. I love to dance too! My lifelong need to be creative has led me to many forms of art, including photography and mixed media. My work in digital scrapbooking and art journalling has been published in both digital and print magazines. However, it wasn’t until I discovered digital artistry, art that uses photography to create artistic work, that I found my real passion. This passion continues as I now explore the painterly world of acrylics and canvas. Always eager to learn, I am currently exploring new ways to express my artistic self. I create art in a variety of ways including digital works, mixed media, and painting with acrylics on canvas. Inspiration comes from the interesting lines, shapes, colours, and light in the world around me and the rich inner world of my imagination. My art reaches out on an emotional level to inspire feelings of joy, peace, or empowerment and has a richness of texture and colour that invites exploration. My hope is that the viewer not only sees the beauty in art, but also feels the emotion in it. 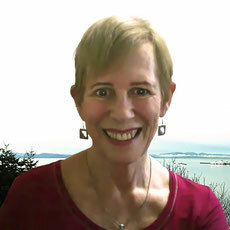 I am an active member of the South Delta Artist Guild. My work is displayed at Gallery 1710 in Tsawwassen and at local art shows. 2017 - Special Recognition award: Botanicals Art Exhibition "Purple Rain"
2017 - Special Merit award: Botanicals Art Exhibition "Passion"
2017 - Special Merit award: Figurative Art Exhibition "Enigma"
2017 - Honourable Mention: Cityscapes Art Exhibition "La Tour Eiffel"
2015, 2016, 2017, 2018 Published in numerous issues of LIVING THE PHOTO ARTISTIC LIFE, an international digital and print magazine. 2016 DREAMS AWAKE a project created with Adobe Spark. featuring new work and any upcoming shows. And don’t worry – I’ll never share your email address.